Figures published by the Society of Motor Manufacturers and Traders (SMMT) each month show that electric car sales in the UK have risen dramatically over the past few years. While only around 500 electric cars were registered per month during the first half of 2014, this has now risen to an average of more than 5,000 per month during 2018. By the end of 2018, more than 60,000 plug-in cars had been registered over the course of the year – a new record. This significantly improved upon the previous record, set in 2017, increasing it by more than 13,000 units. By the end of the year, plug-in cars as a proportion of total UK registrations reached 3.8%, and averaged over 2018 electric cars represented 2.7 per cent of the total new car market in the UK. The cumulative figure also shows sustained and dramatic growth of the EV car and van market. 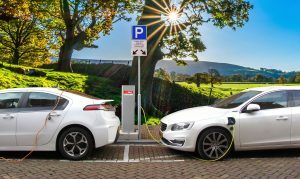 According to the Office for Low Emission Vehicles (OLEV) and SMMT, around 180,000 claims have been made through the Plug-in Car Grant scheme. Taken together with the fact that a significant number of electric cars and vans which are not eligible for the grant schemes have also been registered, the total UK light-duty electric fleet is more than 210,000 electric vehicles strong. 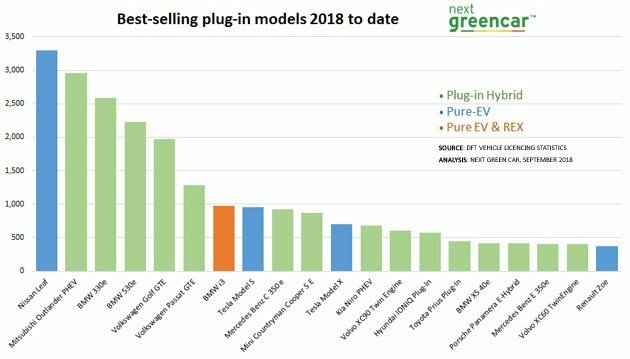 The latest Department for Transport figures available show that Mitsubishi’s Outlander PHEV is the most popular plug-in vehicle as of the end of September 2018, and by some margin. With almost 37,000 units sold, it has been the best-selling plug-in car for more than three years, and is considerably ahead of the second most popular plug-in car, the Nissan Leaf. 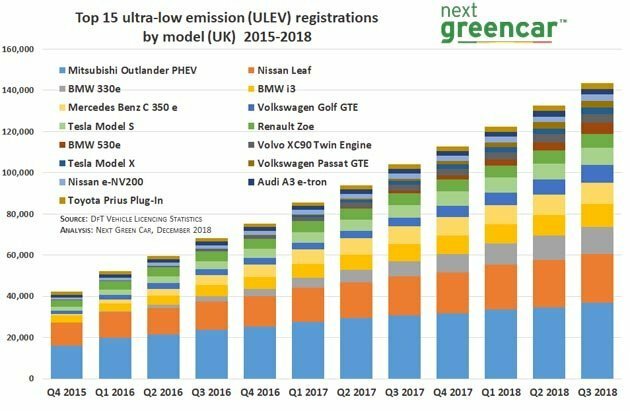 Just under 24,000 Leafs have been sold in the UK though, making it the best-selling pure-EV in the UK, and still comfortably ahead of the quick-selling BMW 330e. The BMW rose to third place in the best-sellers’ chart in just two years, and went from seventh to third in only 12 months. It now has more than 13,000 sales in the UK to the end of Q3 2018. Joining the 330e towards the top of the table is the BMW i3 with 11,000 sales to date, narrowly ahead of the Mercedes Benz C 350e which – like its BMW 330e executive rival – has quickly climbed the electric car sales charts. Rounding out the top 10 are the Volkswagen Golf GTE, Tesla’s Model S, Renault’s Zoe, the BMW 530e, and Volvo’s XC90 T8 Twin Engine . Plug-in hybrids have rapidly taken the majority share of the electric car market – currently sitting at 68%. From accounting for less than a third of plug-in sales at the beginning of 2014, four years later they represent two out of every three plug-in electric car sales by the end of Q2 2018.